When you stay at the Brickhouse Inn, the only problem you might encounter is finding the time to explore all of the many Gettysburg area attractions. Gettysburg vacations are a wonderful way to relax, unwind, and discover the richness of our Nation’s history, but history is not all that this beautiful area has to offer. Below you will find a list of some of the many other attractions available in and around Gettysburg. The Guns of Gettysburg is an event on Monday, November 11 (Veteran’s Day) from 10 a.m. to 4 p.m. at the Gettysburg National Military Park Visitor Center. There will be a display of the most common weapons used in the Battle of Gettysburg. Veterans and active duty military will have free admission to the Museum, Movie and Cyclorama. 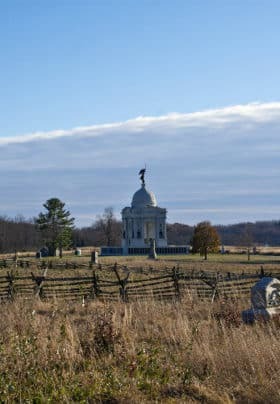 Walks and cycle rides in the Gettysburg National Military Park – There are many attractive walks and cycle rides on the Battlefield (National Military Park) and in the nearby Appalachians. If you do not have your own bicycles, or cannot bring them, you can rent them in the town. Drives in the orchards in the foothills of the Appalachians – These drives are most attractive at apple blossom time (April/May) and at apple harvest time (October). It takes only 20 minutes to reach the foothills, and from there you have many choices of routes and a wide variety of lovely scenery. Tour the Battlefield with a licensed guide – This is the best way to see the Battlefield, which covers 6,000 acres. The guides are licensed by the National Park Service. The guide drives you round the Battlefield in your car for two hours for a fee of $63 (for up to six people), or $94.50 for three hours, which is better because you’ll see the Culp’s Hill area. We charge a $12 booking fee (the same as the National Park Service). We work with a select group of guides who can meet you at the BrickhouseInn for a pre-arranged tour. Having your own guide is preferable to the guided bus tour when you have to share the guide with other people, and when you waste time while the group gets on and off the bus. The self-guided tour with a CD is the least satisfactory way of touring because you have no opportunity to ask questions or have a discussion. You might consider touring on horseback, although you will not see the entire Battlefield, by Segway, or on bicycles. 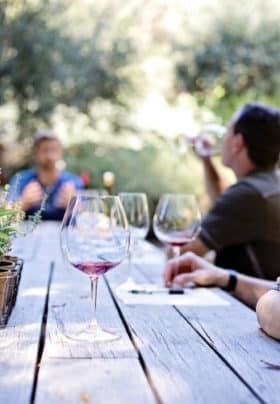 Wine tasting at local wineries – We will arrange bus tours to take you to the wineries, where there may also be musical entertainments. If you use the bus, then you can taste as much wine as you like! Art Galleries, Specialty Shops and Fine Restaurants – The four shops across the road from the Brickhouse Inn offer our guests a 10% discount on most items – the shops are: the American History Store, Habitat gift shop, Battlefield Souvenirs, and Stonehams Armory. We recommend the Dobbin House Restaurant (3-minute walk) for dining; and The Inn at Herr Ridge (five-minute drive). You should also try ‘The Pub & Restaurant’ on the square (8-minute walk), and the Thai Classic Restaurant (10-minute walk). Gettysburg College – a small private liberal arts college, which has a lovely campus with a variety of architectural styles. The Majestic Theater – recently restored theater for live productions. There are two ‘art’ movie theaters in the same complex, as well as two multiplex movie theaters on the outskirts of the town. The Gettysburg Festival (last two weeks of June) celebrating art, music, and books – with live performances and book signings. 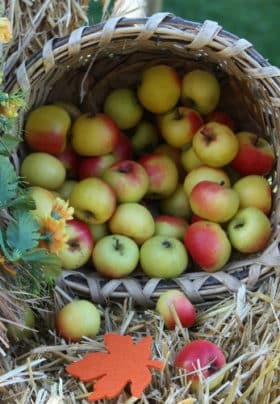 The Apple Harvest Festivals on the first two weekends of October – country fairs with lots of atmosphere. Ski Liberty – a resort about 20-minute drive from Gettysburg. Snow making when conditions permit. Trips to DC – from April through November – on Tuesdays, Wednesdays and Thursdays. The tour stops at all the well-known war memorials and then allows three hours of free time in the center of the city, within easy walking distance of the Smithsonian museums. The Outlet Village – on the outskirts of Gettysburg, with 72 shops, many of them factory outlets.